Heygate sell-off: How much are we getting? Local activist Peter Tatchell went head-to-head with Council leader Peter John on a recent BBC Politics show. Tatchell accused the leader of selling off the 25-acre Heygate estate for £50m when the Council had valued the site previously at £150m. Peter John responded to Tatchell’s claim by asserting that the Council will also receive a 50% share of the profits from the estate’s redevelopment. However, we know from the leaked Regeneration Agreement that this is not entirely accurate: the agreement doesn’t say that the Council will receive 50% of the profits; it says the Council will receive 50% of any ‘overage’ profit. This is any surplus profit which might be left over, after developer Lend Lease has pocketed a 20% “Priority Return” profit plus a 2.6% “Management Fee”1. In Feb 2013, Southwark’s Cabinet Member for Regeneration admitted in a press article that “currently viability tests suggested there was unlikely to be any profit” from the Heygate deal. We recently took a closer look at the Regeneration Agreement and found that it required Lend Lease to send a cash flow statement to the Council on a quarterly basis, showing key figures in the development account, including any currently estimated profit overage. This is poor practice on Southwark’s part. If the Regeneration Agreement were adhered to, Southwark would receive 60 audit reports from Lend Lease over the 15 year construction period, but now it looks as if it will be content with just five (one for each phase). Southwark is entirely dependent on Lend Lease’s management of the development account for its overage, while Lend Lease is self-financing and completing the scheme using its own in-house construction arm - it controls the whole situation. Southwark should also note that last year City Authorities in Sydney lost a court battle with Lend Lease over the calculation of profit overage in a similar-size public/private regeneration scheme. The audit requirements set out in the Regeneration Agreement allow ongoing monitoring of Lend Lease’s development account on a quarterly basis, precisely so that such outcomes can be avoided. Council leader Peter John should enforce the terms of the agreement and publish the audit reports with profit overage calculations on a quarterly basis, on the Council’s website for all to see. Southwark should also stop fudging about the affordable housing figures for the site. 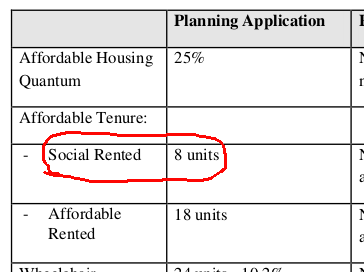 During the BBC debate, the Council leader claimed that social rented housing would be provided “in greater numbers than Peter Thatchell described”, but without saying what number. Combined with the 8 social rented homes provided as part of its separate phase one application - Trafalgar Place (235 units), that’s 2,704 new homes on the redeveloped Heygate estate of which 82 will be social rented. A further 198 will be ‘affordable rent’ and 316 will be shared ownership homes. We would be glad to hear that the Council leader has since secured additional social rented housing, but fear that this is once again just an attempt to pass off the 198 ‘affordable rent’ homes in the development as social rented. Meanwhile, Southwark’s regeneration drive gathers pace. Its regeneration department has launched an energetic recruitment drive branded the Spirit of Southwark, and is ‘looking for leaders who relish the challenge’ of ‘transforming areas from Elephant and Castle to Canada Water to Peckham’. Last month it also organised a ‘bidders day’, inviting developers to bid on the first two ‘lots’ of council-owned sites earmarked for regeneration. These ‘lots’ comprising 19 sites, include community centres and council homes that will be demolished and redeveloped as part of the Council’s Regeneration in Partnership Programme (SRPP). The lots should deliver about a thousand new homes, with roughly equal amounts of social rented, intermediate and private sale homes - the private sales supposedly cross-subsidising the ‘affordable’ housing. 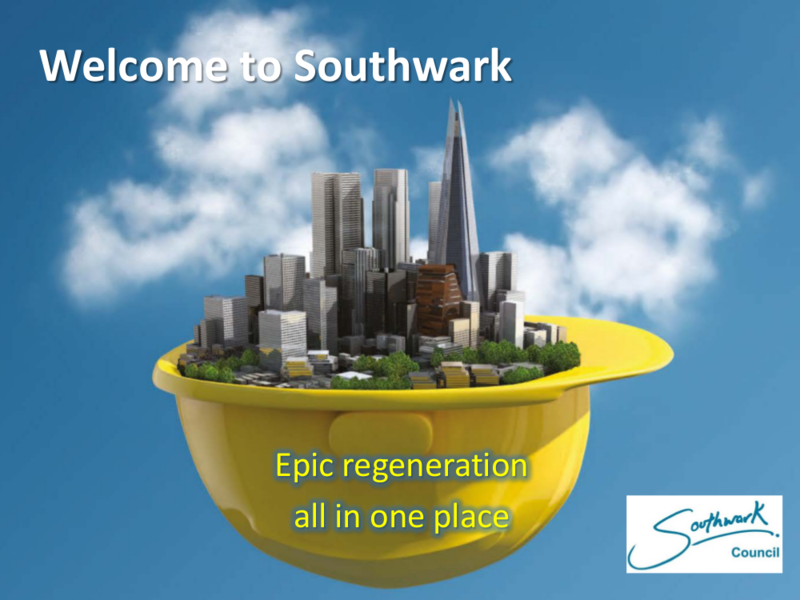 The sites are part of the first phase of Southwark’s pledge to build 11000 council homes and include several that are well described as ‘easy wins’. The recent publication of Southwark’s draft ‘Asset Management Strategy’ for the borough’s council stock, indicates that further gains will be much less easy. 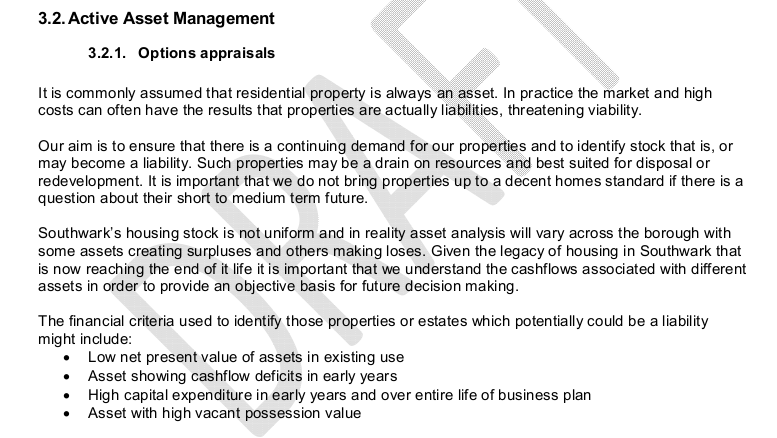 In its appraisal, property consultants Savill’s has identified 4,167 council homes as having a negative Net Present Value (NPV), making them candidates for redevelopment. We have to agree, while also pointing out that Since 2011 the Council has had a blanket policy of selling off all void Council homes valued at £300k or above. Since 2010 more than 1,500 council homes have been sold or demolished. Here is a sample of a number of these sold since 2010 at auction. 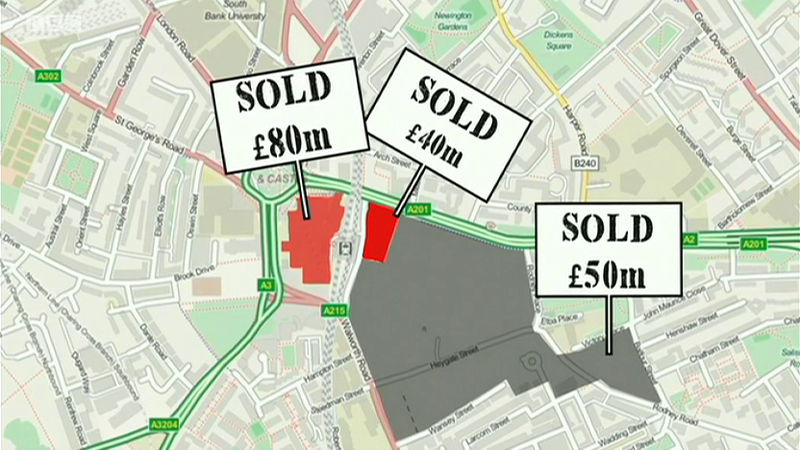 Southwark can argue that the proceeds of their sales go towards new council homes elsewhere in the borough, whereas the Government’s idea is that in future the money goes to the Treasury; nonetheless the practice leaves the Council exposed and opens an obvious door for the Tory government to walk through. Below are two of a number of council homes sold by Southwark under its voids policy at a Savills auction last month.